One of the surprising things about last night's spectacular landing of Curiosity on Mars was the number of famous people who stopped by to watch and hope nothing would go wrong. I wasn't expecting to see Will.i.am there. But there he was, so, as a Jalopnik writer, I decided to take advantage of the opportunity and ask him about his weird custom DeLorean. And if he ever got it back from the cops. Here's what he said. Forgive the lousy video, I wasn't really expecting to be doing this particular sort of thing. He's still pretty vague about exactly what he did with that DeLorean, and he still claims he's just using the doors. I'm not sure if I really buy any of that, but I'm a bit reluctant to make too much fun of him because he is doing it for a good cause, the STEM education coalition to help get kids interested in math and science. Even if I don't believe the "custom chassis" part and I don't think he knows what engine's in there. My thinking is this: he's actually driving around in a DeLorean, but the next car won't be DeLorean-based. Apparently, it'll be an EV. So, if this somewhat ugly and faintly absurd car can do that, why not? I've loved far uglier and absurd cars, and I'm all for math, science, and clever, geeky kids. He did show up last night to JPL, and he does seem to be genuinely interested. 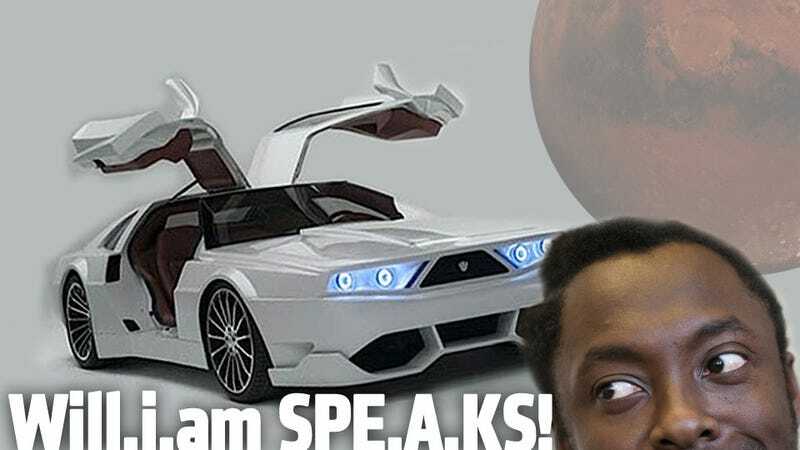 So, for my part, I'm declaring a Jalopnik truce on making fun of Will.i.am's custom cars. Unless the next one's really bad.